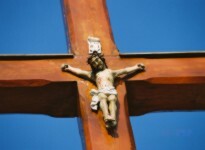 At the bottom of the pole there are pieces of silver Judas coins stuck in the cross - the symbol of betrayal. In Gorzyce Małe still in 1935 there was a huge cross with a rich iconographic program, depicting the drama of the Fall and the history of Redemption. Unfortunately, this beautiful monument did not survive the turmoil of the war. Currently, on a new, bulky cross hangs an excellent, though small in size, sculpture of Christ Crucified carved by Paweł Bryliński. 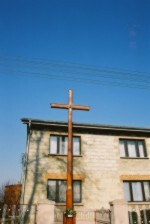 The cross with a sculpture of P. Bryliński. Gorzyce Małe. The Crucifixion carved by Paweł Bryliński.